In 1969, a group of writers and editors working for the Georgia Straight published the first of several literary supplements inserted into the weekly Straight. The Georgia Straight Writing Supplement featured work by writers such as Straight editor/publisher Dan MacLeod, Stan Persky, Milton Acorn, Gerry Gilbert, Jack Spicer, George Stanley, Robin Blaser, Maria Hindmarch, Jim Herndon, Dennis Wheeler, and Colin Stuart. Within a year, the informal group of writers and editors behind the GSWS began publishing books under the name Georgia Straight Writing Series (GSWS). Early work by bill bissett, Judith Copithorne, Fred Wah, Brian Fawcett, George Bowering, and Daphne Marlatt featured in this series. Within another year, internal schisms within the Georgia Straight resulted in an exodus of many of the writers/editors connected to the GSWS from the weekly paper. As the “York street commune”, the book publishing project continued under a new imprint, Vancouver Community Press. By 1974, the make-up of the collective had shifted, and so too had the press's editorial focus, which began to emphasize non-fiction titles about current affairs and politics. One of these books, Two Roads by Jack Scott, a largely positive account of the People's Republic of China (Scott was one of the first westerners to visit, and write an account of, the China of Mao Zedong and the Cultural Revolution) inspired another name change, to New Star Books, marking a the shift in editorial emphasis away from literary work and toward series non-fiction about politics. By 1978, the York Street commune was no more, and Lanny Beckman, who had joined the press in 1974, became publisher, a position he held until 1990, when Rolf Maurer assumed the role. This last change coincided with a return to the press's literary roots: while New Star continues to publish books about politics and social issues, it also resumed publishing poetry, as well as prose fiction and non-fiction. As well, books on local history and culture became an important component of New Star's list. In 1998, New Star moved across town to its current location, at 18th and Commercial Street in East Vancouver. 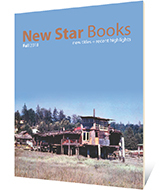 Today, New Star Books publishes six to ten new titles per year. We acknowledge the Government of Canada's financial support for our publishing activities through the Canada Council for the Arts and the Canada Book Fund. We acknowledge the financial support of the Province of British Columbia, through the British Columbia Arts Council and the Book Publishing Tax credit.